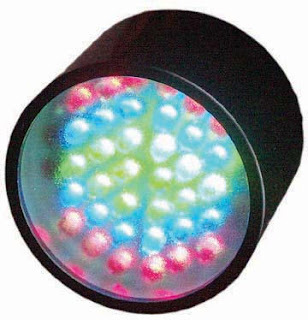 When choosing a LED flashlight many times you are offered a choice of colors for the LEDs, there are red, orange, yellow, green, blue, cyan and many other colors for LEDs; the big question is how should you choose? When do you need an orange LED? What can be a good scenario for using a green LED? In this small article we present the basic properties of the different LED colors and suggest some scenarios where that particular color can be useful. From Infra Red LEDs to the UV LEDs seen on CSI TV shows. You can read this article in our special featured article following this link. The funbiners are small carabiners made of light aluminium from Black Diamond. They are smaller than climbing carabiners and are totally unsuitable for climbing. 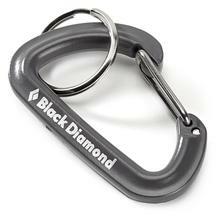 Black diamond sells the funbiners as connections between carabiners, flasks, tools and other items to your backpack or bag. As keychains they are much stronger than the normal aluminium carabiners and the spring is a lot better so they can be a nice improvement in your keychain while keeping the same size and look than the regular keychain carabiners. You can read more in the product page and you can order them in different colors and two sizes from $3 from REI. 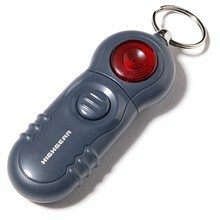 This keychain provides a splitring for your keys or items and two additional functions: A personal alarm and a safety strobe light. The unit is powered by a C2032 lithium coin cell which is very popular and easy to get, to activate the unit you have to open the battery compartment and remove a plastic tab, something that the instructions don't mention because there are no instructions supplied. The strobe is activated pressing the red button, the red light will start flashing, press again and it is off. To activate the personal alarm you have to press the gray button and then pull the body of the device away from the red button, the alarm will activate; to deactivate it you have to press the button and then push the body. This is intended to make deactivation of the alarm difficult for people not familiar with the device, in my opinion this is fine but the activation should have been more easy in case of emergency. The alarm is about 80db loud enough to attract attention but not enough to be harmful to the ears of an attacker. The SmartLatch costs $15 and can be ordered from REI. The Air Hook Caddie is a keyring that combines a carabiner-style clip with quick-release mini keyrings. The Caddie is made in aluminium and can be ordered in 3 different colors: black, purple or blue. The carabiner is strong and can be clipped to belt loops or other attachment points without serious risk of losing it. The quick release keyrings feature small splitrings that can be released from the keyring using a sliding button on one side. You have to place the splitring you want to remove below the button, slide it and then pull, they item will sepparate from the body of the caddie. With this system you can quickly remove a keychain flashlight, pen or knife from your keychain in case of need without the need of operating a splitring. The caddie costs $10 and can be ordered from REI. 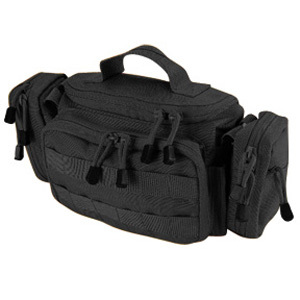 This is a Waist pouch by TOPS (tactical operation products), it features a main compartment with a handle, two removable side pouches and a zippered front compartment. The main compartment has plenty of space for several items, the "U" shape zipper is a good idea to load and unload items on the go. Inside the compartment you can find a removable pocket for 6 CDs/DVDs, a net pocket for loose/small items and a flapped pocket that can be used to carry batteries or other small items. There is also a small cord with a clip for keys or small items. The front compartment has internal pockets for flat items and a net pocket. The front pocket has MOLLE attachment points to add extra pouches if you want to attach carabiners or other objects. At the sides you will find two pen pockets for pens that have a clip. The side pouches can be removed using the MOLLE system, you can move them to the front if you want for example, they have a small zippered external pocket. These pouches are good for radios, multitools, flashlights, phones, PDAs and other items that you want to access quickly. On the back you will find yet more MOLLE attachment points in case you want to attach this waistpack to a backpack or something similar, the waistbands can be stored inside the back of the waistpouch if you want to carry it with the top handle or attached to a bigger pack. The construction is excellent made of cordura nylon with reinforcement points and double stitching, the amount of things you can carry is surprising for the size of the bag and there are many possible configurations and reconfigurations for different needs. You are getting 3 pouches for the same price, the big one and the two small side pouches. The only small drawback I can find about this bag is that it is a tad big for EDC in a urban environment but is certainly great for any kind of small travel you do or as a complement to your backpack or large bag. You can read some extra information from Tops website and buy it for $50 from LightHound. The Huntlight FT-01XSE is a 3 watt U-bin or T-bin luxeon led flashlight powered by 2 C123 lithium batteries. The body is HA-III anodized aluminium, very resistant to impacts and scratches. The switch is a simple tailcap reverse clickie. It comes with a UCL lens covered with anti-reflex coating and a pocket clip that can be used to carry the flashlight bezel down in your pocket. The bezel is crenelated so you can see if the flashlight is on or off if you put it bezel down on a table or some other surface, I don't think the crenelations can be used for self defense purposes since they are quite soft and not very deep. The flashlight is waterproof using orings for sealing, mine came with interesting orange orings. The beam is a nice combination of throw and sidespill it has a lot of reach compared to similar flashlights in the same category. You can be surprised how many other flashlights will be beaten by this one. The light can be powered by primary C123 batteries or a 18650 rechargeable battery, the runtime is aproximately 3 hours and a half on primaries and a little over 4 hours on a 18650 battery. My estimations for the brightness of this flashlight is that it should be around 70 to 80 lumen. 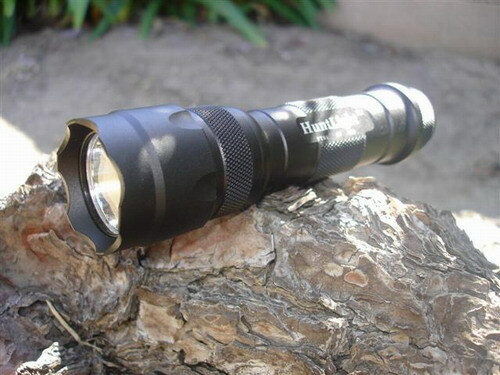 This huntlight is a very beautiful flashlight, the runtime is great, it can be used with a rechargeable 18650 battery which is a good point and is very very bright. I also like the fact that it can be carried bezel down in your pocket. You can find more information and buy this flashlight for about $68 from JS Burly's Flashlights. This is a new version of Petzl's tactikka headlamp adding several improvements including the very versatile "Adapt" connection system that allows the headlamp to be used in several different ways. The headlamp is driven by one 1 watt led powered by 3 AAA batteries, there are 3 brightness levels and 1 blinking mode selected pressing the on/off button, you go from off to max, mid, low, blink and again to off. There's also a boost mode selected with a second button that can be used for extra brightness for short periods of time. The lamp has a sliding filter that can be used for a difusser filter, or a color filter, red, green and blue are supplied. The "adapt" system allows the user to use the lamp in different modes, attached to the headbands you have a traditional headlamp. You can also attach the light to a belt clip and use it on your belt or a backpack. Finally there is an adhesive attachment point that can be used to attach the lamp to a helmet, a bike or others. The headband includes a small plastic pouch to carry an extra filter so you can use a red filter and have a diffusor filter available if you want. The difussor is very good for reading and close tasks. In maximum mode the headlamp reaches about 35 meteres and has autonomy for 60 hours and it can go to 120 hours in low brightness mode. The boost function allows a maximum throw of about 50 meters in case of need. This is a very nice headlamp with different brightness levels, boost mode, sliding filter and excellent runtime, the adapt system makes it even better adding a lot of interesting uses besides being a great headlamp; a very interesting product. 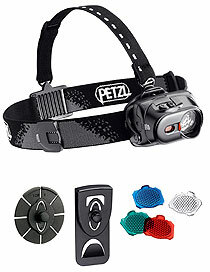 You can read more about this headlamp in Petzl's webpage or you can order it for about $58 from TAD Gear.